Thursday November 26 is the harvest festival. As traditionally families, not large groups, celebrate this festival, no events are planned. Saturday November 28 promises to be a very busy night indeed. Firstly, Saturday November 28 is game night, presented by the troubadours of UO Radio and hosted by Majestic Oaks Auction and the City of Minoc. There will be two games, both held at the UO Radio/Majestic Oaks Auction game house, which is far south of Luna, on the other side of the great bridge of the Sea of Stars, on the west side of the road. It's typical that gates are offered form Luna, at least until the games start. The first game is Deal or No deal, at 6pm Central/7pm Eastern. The second game is The Price is Right, at 9pm Central/10pm Eastern. 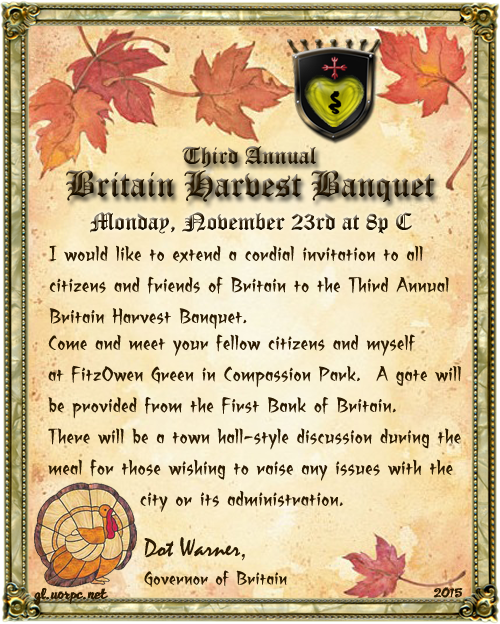 Thirdly, on Saturday November 28 an event of an uncertain nature is on the Crown's Calendar for 8pm Central/9pm Eastern. Fourthly and finally, as noted above, by that date the Governor elections should be underway. I am not in the slightest above using this forum to point out that my wife, Governor Tanda of Minoc, has performed exemplarily in that role.